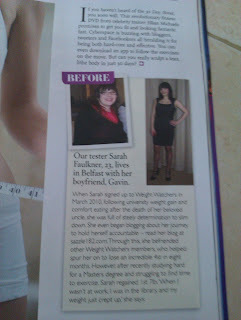 I'm in the Weight Watchers UK Magazine! I know a lot of you already know this through twitter or flicking through the magazine yourselves, but this month (the April 2012 edition), currently in the shops. 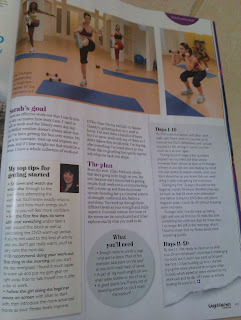 I am in the magazine! Not as a cover star sadly, nor as one of the success stories that get to dress up and tell their story (But I will be one day! Positive thoughts! ), but as a reviewer! Last November the magazine got in touch with me asking would I be a "blogger of the month", what it entailed was me to use Jillian Michaels 30 Day Shred (you can get it for £5 from amazon with free supersaver delivery - price correct as of today 14/03/12) and doing it. Every day, writing notes as you go along, and then I was given a list of questions I should answer and a loose structure to stick to. It was fun, I like Jillian Michaels, I like her DVDs and I really am honest saying that this one is a good one. What the magazine doesn't say is that I did this in late November and early December. I was doing a lot of socialising, eating and drinking at the time, and I really think that it was my "damage control" it could have been so much worth my weight gains, it should have been really. The writer in me is extremely pleased that I had the opportunity, and even more pleased that my piece wasn't too heavily edited, to the point where it wasn't me who wrote it. 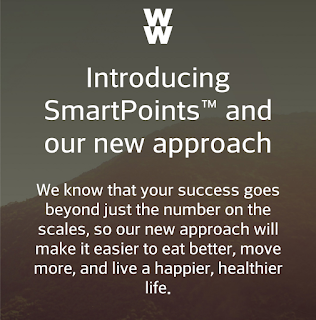 And that no one from the weightwatchers team took my notes and wrote it themselves (which has sadly happened to me before). It came out perfectly, better than I imagined the final piece and for that I am super grateful to the lovely team. I've been asked by American followers can I put up a few scans of the article and I will, just once it is out of the shops. I'll scan and upload them to here, so you'll have another blog post about this soon enough! Until then, here's a few photos of the three page spread! New post scheduled for tomorrow. Organised specific blogging hours into my schedule so I can keep on track. 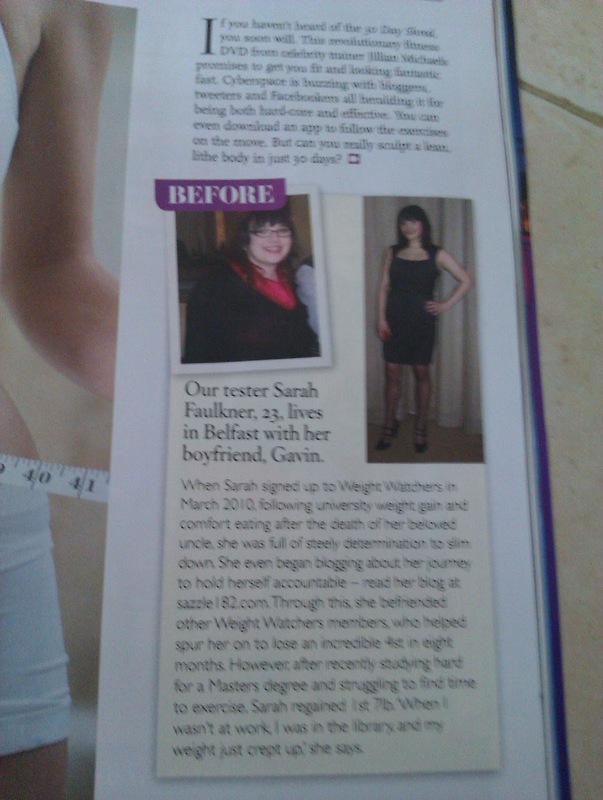 I finally just want to say a massive thank you to the weightwatchers magazine UK team for giving me such an awesome opportunity! And you may have noticed that the blog looks different, that's because I have moved my blog from posterous to blogger over the last few days. For a lot of reasons which I'll delve into at some other point. I'm going to explain how I did it because it took me a few months to work out how to do it myself and google search results were a let down. Posterous are all about importing blogs, but not exporting. This shouldn't really affect any of my readers unless you subscribe to my (very) old URL http://redrunner.posterous.com if you do you're going to need to update it to http://www.sazzle182.com. As this is a fairly recent switch over some of my old links might not work yet, but I'm working on fixing most of them.